By James M. Dorsey- 10 October 2013 Financially stressed Turkish soccer clubs are becoming pawns in the political struggle between Prime Minister Recep Tayyip Erdogan and militant soccer fans who rank prominently among his detractors as soccer pitches and university campuses emerge as major battlefields between the government and its detractors. Critics of Mr. Erdogan charge that the prime minister is seeking to enlist clubs in much the same carrot-and-stick way that he tamed the media by exploiting financial vulnerabilities and turning Turkey alongside Iran and China into the country with the most journalists behind bars. The impact of Mr. Erdogan’s effort to restrict media independence and limit independent critical reporting was evident when last June television stations broadcast soap operas and penguins instead of pictures of mass anti-government protests on Istanbul’s iconic Taksim Square in which soccer fans played a prominent role. Soccer may however be a tougher nut to crack than the media. Soccer unlike the media has militant fans determined to thwart Mr. Erdogan’s attempts to use troubled clubs to whip them into line. Fans have defied a recent government ban on the chanting of political slogans during matches, rejected attempts by clubs on instructions of the government to sign pledges to abide by the ban, and ridiculed a government public relations campaign that portrays peaceful protest as a precursor for suicide bombings. The government has taken similar steps to pacify university campuses, including cancelling scholarships for students who had participated in the anti-government protests sparked by plans to replace Taksim’s historic Gezi Park with a shopping mall. Turkish authorities recently arrested 25 students aged 13-19 who visited Iran on suspicion of espionage and propaganda activities. While the arrests reflected tense Turkish-Iranian relations over Syria, it occurred amid a campaign to deter anti-government activity among students. “They can try Gezi protests in universities. People should not ruin their lives, should not have criminal records,” Turkish sports minister Suat Kilic warned last month in an ironic twist given that Turkey with its history of military coups and the Erdogan government’s crackdown on the media has scores of intellectuals and journalists with police records. Among those is Mr. Erdogan himself, who spent four months in prison in the 1990s for reciting a controversial poem. 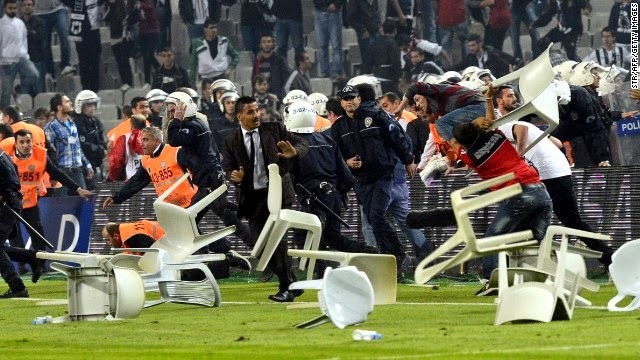 Mr. Erdogan’s ability to whip clubs into line and employ them in his confrontation with soccer fans has been enhanced by the debt burden under which Turkish teams are laboring. Bloomberg News quoted the Istanbul stock exchange as saying that short-term borrowings of storied Istanbul club Besiktas JK, its Istanbul rival and Turkish champion Galatasary SC and Black Sea club Trabzonspor FC created “uncertainty over the sustainability” of their finances. The bourse said that shareholders’ equity for each was negative. Galatasaray is staring at $57 million of debt due in the next year as the result of the expensive acquisition of players like Didier Drogba and hiring of Coach Roberto Mancini. Even so Galatasary with a debt-to-cash ratio of 13:1 compares favorably to Trabzonspor’s ratio of 40:1 and Besiktas’ 24:1, according to data compiled by Bloomberg. “If Turkish soccer isn’t reformed, institutionalized and if all goes as it has so far, Turkish soccer is doomed to hit a wall,” said soccer economist and journalist Tugrul Aksar. The battle over freedom of expression on the pitch was being waged as Mr. Erdogan unveiled what he termed a historic democracy package that granted greater liberties but fell short of the expectations of liberals, Kurds and Orthodox Christians and seemed to run counter to concepts put forward by President Abdullah Gul, a co-founder of the prime minister’s ruling Justice and Development Party (AKP). Mr. Gul, who is gunning for the prime minister’s job, has in recent days voiced far more liberal and inclusive concepts of democracy than the majoritarian ones advocated by Mr. Erdogan. Mr. Erdogan, who has promised not to seek a fourth term as prime minister after leading the AKP to three sweeping electoral victories, is expected to run next summer for the presidency. Many analysts suspect however that he may only keep his promise if he can turn the largely ceremonial office into an executive one. The battle for greater freedoms also occurs as Turkey braced itself for next week’s European Union progress report that was expected to take the government to task for its hard-handed handling of the Gezi Park protests, limits on the freedom of expression and freedom of press, and the deceleration of its reform process. In a twist of irony, anthropologist Elif Babül argues however that EU programs designed to bring the Turkish police in line with European standards have served to enhance law enforcement’s capabilities and better package rather than reduce its disproportionate use of force. The brutal response of the police to the Gezi Park demonstrations turned a small environmental protest into mass anti-government protests with thousands of militant soccer fans on the frontline. Ms. Babül’s somber analysis suggests that violence is inevitable in future confrontations between the government and street-battle hardened soccer fans determined to stand their ground. “My research on human rights training programs for Turkish state officials has taught me that the meetings and workshops organized to improve the capacity of Turkey to become a member of the EU are far from unproductive, useless sites of whitewashing that help the government continue business as usual. On the contrary, these workshops, projects, and other tools of harmonization actually serve as platforms for government actors to manage the terms of EU membership, and the governmental standards that they entail,” Ms. Babül wrote. “It is by conducting projects that state officials come to learn what these standards are really about. They are place-holders for democracy and the rule of law that are supposed to be managed strategically in order to reduce liability and perform a level of development. For instance, it is by interacting with the British police at experience-sharing meetings that the TNP officers learn what it takes to become ‘security experts,’” she went on to say. “Rather than installing mechanisms to fight impunity within the organization, they learn that what they need is “better policing” that can be attained by building crime databases or by setting up high-tech labs to better conduct forensic investigation… Scholars who are critical of democratization and development industries have shown that programs for economic and political transition continue to produce unexpected outcomes in a variety of places, leading to more accentuated forms of exclusion, inequality, and authoritarianism. The contradictions between the stated goals and actual outcomes of these projects are inherent to the world of development,” Ms. Babül cautioned. Among those facing allegedly unfair or inflated charges are 20 members of Carsi, the popular support group of Besiktas who stand accused of being members of an illegal organization. Carsi’s reply in defiance of the ban on political slogans has been to chant "everywhere is Taksim, everywhere is resistance" during matches echoing a popular June protest tune.